Links in this post are affiliate links as I team up with Cowgirldirt to offer you a fabulous place to buy mineral makeup. While I am a minimalist when it comes to make-up, I do have two must-haves if I’m going out and about: foundation and a bit of eye make up. But it’s hard enough to get the right skin tone color, let alone find anything that would be even remotely considered natural. Enter: mineral make-up. 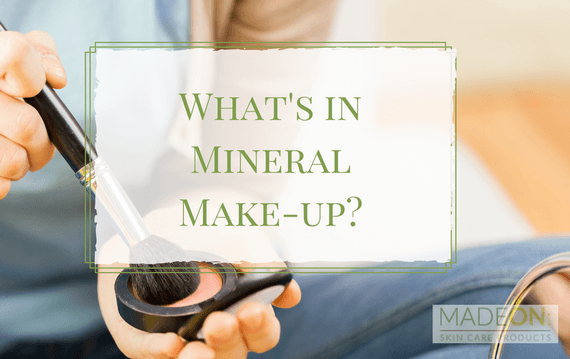 Mineral make-up is made with ingredients like titanium dioxide, iron oxide, zinc oxide, and micas. We’ll dig into those ingredients next time, but if you’re not interested in making it yourself (or even if you are), those are the ingredients you would look for. So after seeing various Facebook friends liking and sharing links to Cowgirldirt.com, I had to find out for myself if it could possibly compete with the stuff you find on the store shelves. The colors come from the iron oxides and titanium dioxide. Not only are the ingredients safe, but you’re adding some really good oils to your skin when you apply this concealer. I purchased about 15 products, but all samples (why get stuck with a bottle of W4 when I’m a W3?! W= warm). I tested them out, and gave a few to my daughter to try, too. Adhesion (How long and how well does the product stay on? ): I applied the Rio Grande Liquid Foundation in the morning and while it looked freshest when I first applied it, hours later my skin still looked great. Slip (How does the product go onto the skin – is it creamy? ): The foundation I tried felt heavy at first, but immediately absorbed into the skin. After applying, it did not feel heavy. There is a bit of a scent to get used to, but that appears to disappear upon application. Function: (Does the cosmetic do its job as promised? ): Yes! Absolutely, yes. This was most important to me, and it did not disappoint. I found a color that matched my skin perfectly. In addition to the foundation, I tested out lip products. The lip glaze called Six Shooter is my absolute favorite. . I returned to buy a full bottle of foundation, and mascara, which I haven’t tried yet. I’m totally sold on this company, and when I went back to ask if they’d donate a $25.00 gift certificate to this week’s giveaway, they were happy to! 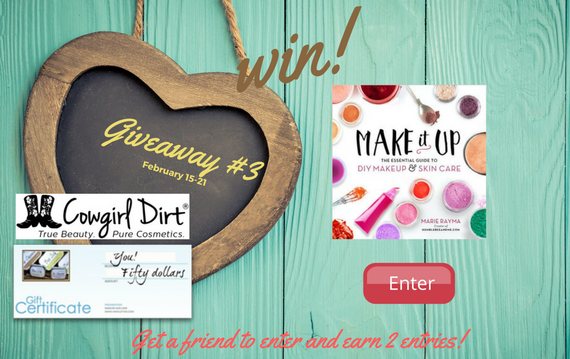 So this week, we’re giving away a $50 MadeOn Gift Certificate, a book “Make it Up: The Essential Guide to DIY Make Up and Skin Care”, and now, a $25 CowgirlDirt gift certificate.